sailboat. : October Sponsor Love #1. Since opening up my sidebar to sponsors, I have discovered some truly incredible blogs and small handmade businesses written and run by such lovelies. I hope you find some new reads through these posts, part two will be up tomorrow morning! I am now accepting sponsors for the month of November, email me at sailorjennie@googlemail.com if you're interested! A Little Wishing is written by the ever beautiful Ellie and documents her love of literature and photography as well as offering little snippets into her daily adventures. Ellie is so creative, she has such a wonderful way with words and I'm completely sure you'll fall in love with her musings as much as I have over the last few weeks! 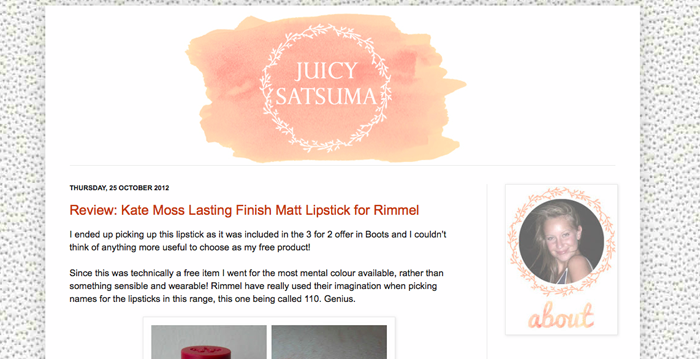 Juicy Satsuma is a beauty & fashion blog written by Lisa, a lover of organic and natural products, cupcakes, cups of tea, the 1950s & cute cats! Lisa writes such wonderful product reviews that are always illustrated with clear photographs and you can count on her to point out any negatives as well as the positives. You always know that you are reading her honest opinions, and that's something I really appreciate. Amiee is one super talented lady, not only does she write and run a beauty, fashion and lifestyle blog, she is also a truly wonderful photographer and I love having a flick through her portfolio. Aimee is mama to a beautiful baby boy, Byron, and her blog is almost like looking through a beautiful scrapbook filled with memories, adventures, Aimee's life and her loves. I really feel like I've got to know Aimee through her posts over the last couple of weeks, she is such a lovely lady and I wish I knew her in 'real life' because I can tell she'd make the best friend ever! Blog. // Twitter. // Photography Portfolio. Dreamer is a beauty and lifestyle blog written by the lovely Rachel. Her posts are a wonderful mixture of reviews, wish lists and sweet little updates on her life and her loves. I love Rachel's update posts the most, perhaps it's because I'm a little nosey, but I love knowing how people spend their free time, it makes you feel as though you're catching up over a coffee with a good friend. Rachel is lovely and I promise that you will love her too! Ginger Pickle is a super cute online boutique, run by Jade Murray, that sells original handmade jewellery, accessories, homewares and stationery made by talented British designers. Jade is a huge supporter of British designers and she is a talented lady herself, a graduate of Fine Art. I think the homeware and stationery sections are my favourite, there are so many gorgeous prints that I would love to frame and hang up in my home and notebooks that I would love to scribble lists and inspiration inside. Ginger Pickle is definitely a boutique to have a little nosey around, I'm sure you'll find something you fall in love with instantly! Website. // Twitter. // Facebook. LOVE that I have now found more brilliant blogs to follow! Yay!!! New blogs!!! I am so going to check some of these out! I love the blogs you feature on here, always get the nicest blogs to follow :) and online shops to spend all my pennies at! More blogs to check out! Aw thank you Jennie, this is really sweet! Such a nice post, I like reading this kind of thing and finding new blogs to read! I'm having a MAC Makeup giveaway on my blog if you want to come and have a look? Win something of your choice! They all sound great! I will definitely check them out!